To study the Bible and learn how, visit www.CatholicScriptureStudy.com. To buy Catholic Bible Study software visit www.Verbum.com/Steve. Use the Promo code STEVE for a 15% discount. Writer Amos Wells reflected our need for thorough Bible study in this verse: Leading the Way by Paul Borthwick, Navpress, 1989, p. 139. Galaxie Software. (2002; 2002). 10,000 Sermon Illustrations. Biblical Studies Press. Nice poem. Coming from a protestant background, now catholic, I understand how real this poem is. Once I understood the whole thing about the bible & authority, I came to notice how ignorant of the Bible I was. Nice website Steve. The “funny” thing is, when it comes to the Bible, that people read it in that way. I am aware that sermons “encourage” this by often concentrating on just one single verse. No wonder the flock does likewise (and isn’t that easier, in between a shower and the football game). But they’d never read any other book like that (except cook books – maybe they think the Bible is such a thing, leaving out all the dishes one does not like as much?). How does the Catholic Church teach one to read the Bible? From Start to Finish, cover to cover from Genesis to Revelation? 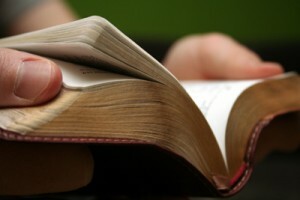 Does God commands us on how to read the Bible? Great post Steve. Being Catholic (now) and a poet to boot wow. I remember it said, that if you follow the daily mass readings for about 3 years, you would have read the whole New Testament, and most of the Old Testament right through. Previous post: We are Going to Mother Teresa’s Canonization- Join Us!